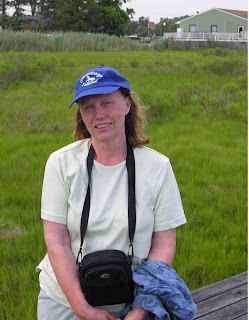 Frank took this picture on the pier that extends into the marsh at the Assateague Inn. 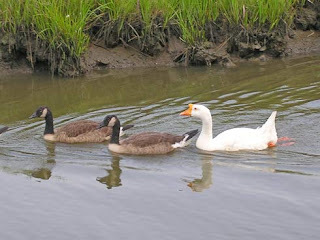 We were out there looking at gulls and geese. 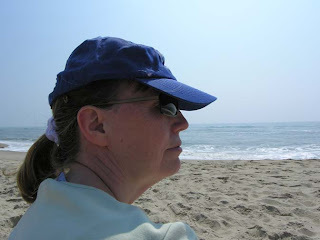 I was wearing my new Chincoteague Island hat. Want to hear the ocean? Click on the arrow -- sounds more like the ocean than any conch shell does. 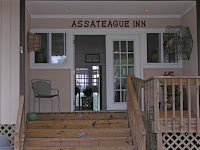 The place we stayed is named the Assateague Inn after the nearby island of Assateague. It's just off "Chicken City Road." 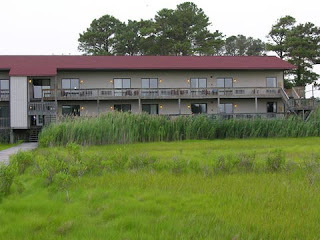 There's a motel called the Chincoteague Inn not far away; we stayed there a few years ago. It was nice enough but I wanted a place with a kitchen. So we reserved a one bedroom apartment. The fridge was a bit small with a freezer just big enough for a couple of ice trays, but I was happy to have a two-burner cook top so I could make wheat-free pancakes. Above is a rear view of the half of the inn which contains our unit. Below is part of the view from our sliding door. Note the large bird perched on the sign. 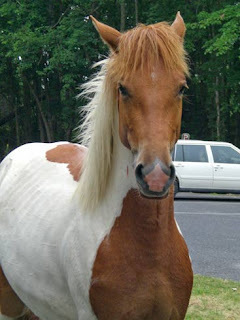 The wild horses of Assateague and Chincoteague have been famous since Misty of Chincoteague was published in 1947. This trio has gotten used to people and vehicles. 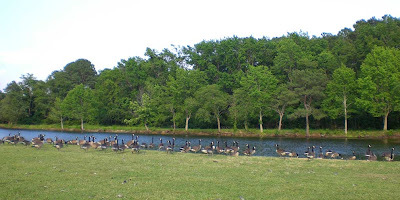 They were in the parking lot next to the "wildlife loop" on Assateague Island. The 2008 "pony swim" will be July 30. I've never seen it but many people love it and come year after year. It is illegal to pet or feed the wild horses. 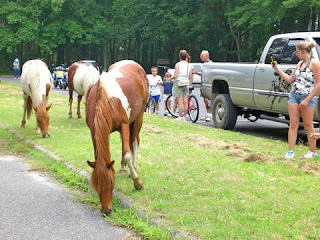 Click for an interesting page about the horses and how they sometimes harass campers. 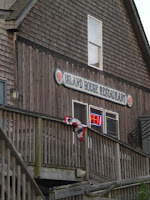 On our first night on the Eastern Shore, we went to the Island House Restaurant in Wachapreague for dinner. 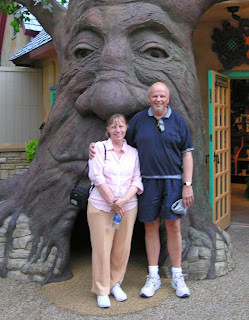 We remembered it fondly from a prior visit and it did not disappoint. 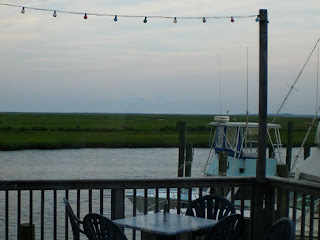 The food was good and the view is soothing. Drove three hours to Williamsburg via I-81 and I-64, an easy drive. Spent two nights at the Marriott Manor Club in Williamsburg. It was adequate but parking spots were scarce. Drove south and then east across the beautiful Chesapeake Bay Bridge Tunnel. 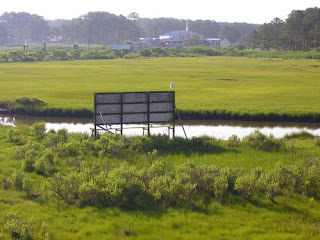 Traversed Virginia's Eastern Shore on US 13, followed the signs to Chincoteague. Made the long ride back home. 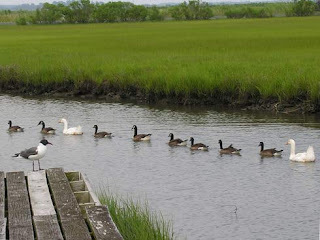 I'll be posting photographs of the Eastern Shore. Here's one taken near Quinby. Walk up the steps from the Casement Museum and see the view. We're looking toward Fort Wool. Sometimes we forget that Robert E. Lee had a long and distinguished career in the U.S. Army before resigning when Virginia seceded from the United States. At Fort Monroe there's a marker for his quarters. I've read that because he knew how strong the fort was, he never ordered an attack on it during the Civil War. Robert E. Lee, future Confederate General, was stationed at Fort Monroe 1831-1834 as a lieutenant of engineers. He had almost complete charge of construction and put the finishing touches on the fort. 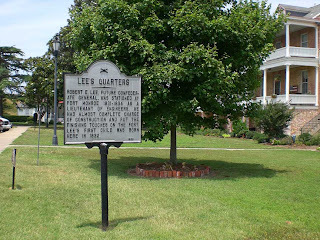 Lee's first child was born here in 1832. See also Lee's 26 Years as an Officer in the Corps of Engineers. 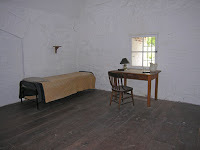 Here we see the cell where Jefferson Davis, President of the Confederacy, was held after the Civil War. He was suspected of being involved in the assassination of Lincoln but there was no evidence and eventually he was freed without being charged. I've seen a website that claims he died there and came back as a ghost, but he lived for many years after being released from Fort Monroe and died at the age of 81. Also, although the room seems a bit dank, all the rooms in the casemate seem that way and they were used as living quarters for officers and their families, so the room was not considered substandard at the time. It's actually a fairly large room. The Casemate Museum has some surprising exhibits. 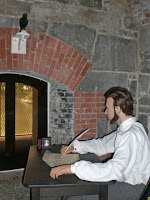 This one depicts a life-size Edgar Allan Poe. It turns out that Poe was once stationed at Fort Monroe while in the military and later returned for a stay at the Hotel Hygeia. It’s said that the inspiration for “Annabel Lee” came from his time at Fort Monroe. 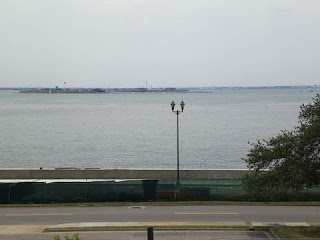 The military base at Fort Monroe is scheduled to close in 2011. The Commonwealth of Virginia will regain the land and is working on plans to preserve recreational opportunities while considering commercial opportunities. See the APVA press release and the Daily Press story. for details. 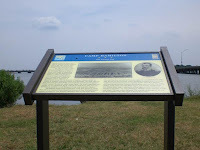 On this sign, the fort is drawn in at the lower left. The other white areas (except for the legend at the top left) represent water. The ships on the right represent the USS Monitor and the CSS Virginia (Merrimack), which battled near there in 1862. 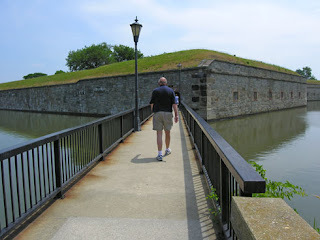 Frank had never seen historic Fort Monroe and I remembered it from a field trip that I took over 15 years ago. 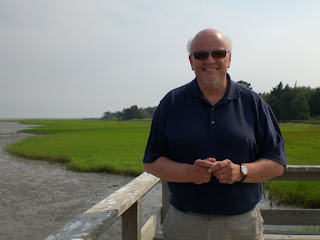 We had talked about going there but would have skipped it as we headed for the Eastern Shore, except that traffic was slowed by an accident as we neared the Hampton Roads Tunnel. "Why don't we get off the highway and see Fort Monroe?" I proposed. He agreed and we followed signs to the fort. It took a while to get through the military gate because several cars were in front of us, but we were entertained by some dolphins playing in the river next to the road. Before long we spotted signs to the Casemate Museum, located in the old stone fort. 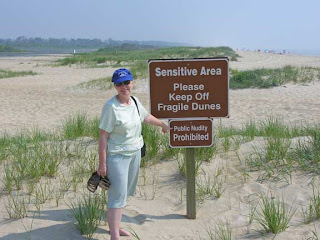 It's a great place to visit except that it's a bit musty from being on (and in) the water. 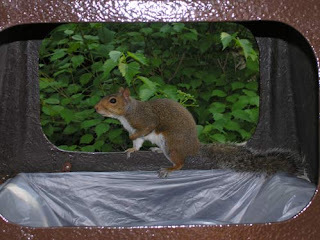 This fellow watches the moat at Fortress Monroe. 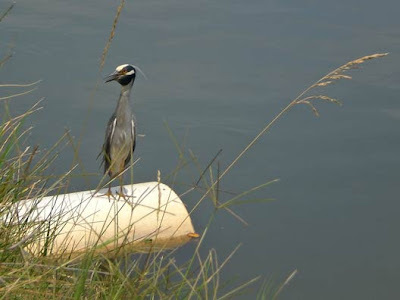 He appears to be a heron of some sort. 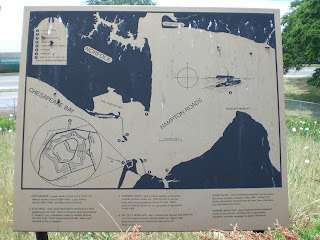 "Camp Hamilton - On Sacred Soil"
This Civil War Trails marker is near Fort Monroe at Phoebus, VA (now part of Hampton). It tells us that "Here stood the U.S. Army's first camp on Virginia soil after secession, built in May 1861. 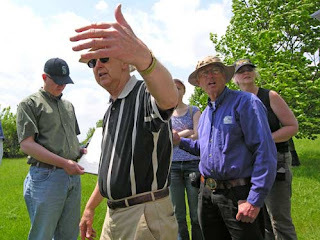 Only the Veteran's Cemetery on County Street remains of the entrenched camp." The camp was established to strengthen Fort Monroe, which was still held by the Union, and remained a Union base throughout the war. 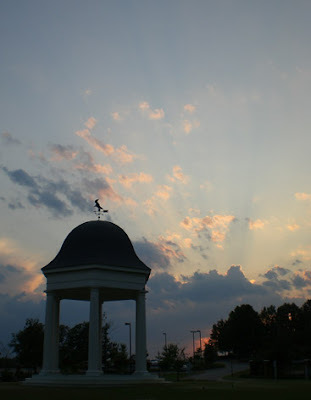 This scene is at a traffic circle in Ford's Colony, a planned community much like Montclair, VA. Ford's Colony is a nice subdivision if you want to live in an urban area that's not a big city. Here we are in late afternoon at the amusement park. I was really dragging by that time, probably dehydrated. We had purchased an overpriced bottle of water earlier and refilled it from the tap several times, but we did not find any salty chips to buy. I had used up the cashews that I brought in my pocket and I really needed to consume something salty. 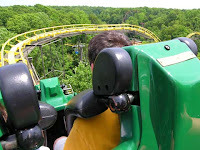 We enjoyed the musical shows at Busch Gardens. 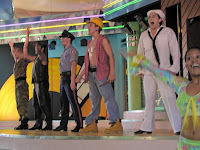 These scenes are from a high-energy musical called American Jukebox. I have to give these young performers credit for their talent and their stamina. 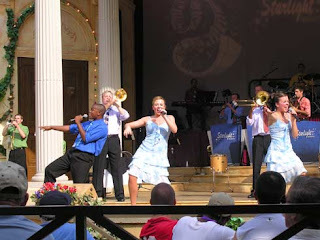 It was warm in the outdoor theater and they kept up a frantic pace for the entire half-hour show. 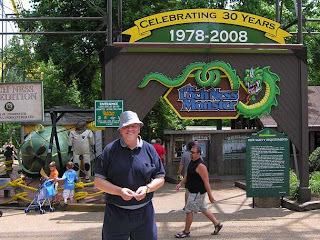 The Loch Ness Monster at Busch Gardens Williamsburg is celebrating her 30th anniversary. I was surprised to learn that because I remember when the monster was born... there were dramatic commercials telling you to experience it. Yet until today I never did. It wasn't all that bad... but shortly after I snapped the picture on the right, I put my camera down and shut my eyes. These are a few pictures of our class at the monastery near Berryville. 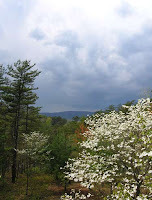 We were studying the Battle of Cool Spring (mentioned previously). After Dr. Poland described the battle, we took a break and visited the abbey's shop, which carries a book about the battle as well as religious books, fruitcakes, and truffles. Our view is under threat! A proposal has been made to put up over 100 wind turbines in George Washington National Forest. They would be huge: 440 feet tall! I understand each one would require much clearing of forest and the building of a substantial road. Obviously this will have an environmental impact on the forest, plus giant windmills can be hard on bats and birds. Those who were on the Third Winchester Field Trip may recall that troops had to cross Red Bud Run. Click the arrow to see how it looks today. 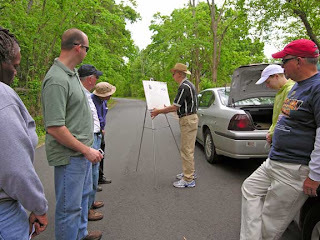 I've posted draft pages of the Trevilians Station and Piedmont Battlefield Tour on my Civil War Field Trips website. The pictures and format are there. Take a look! This is me at age 11. That was a long time ago. Sometimes I feel my age. I have an old sacroiliac injury that has been causing me trouble. This morning it felt like burning in my right hip and lower back; then sharp pains started shooting down the back of my right leg. I called the chiropractor's office and they said Dr. MacDonald could see me at 11:20. The treatment helped but of course I'll need to go back. A couple of months ago he explained that I have a torqued pelvis, my sacroiliac being a bit out of joint. A nerve was impinged, causing me odd symptoms like numbness in my feet sometimes. The injury goes back many years, maybe 15 or more. Sunday and yesterday we did some gardening and painting so I guess I overdid it and paid the price. Frustrating. 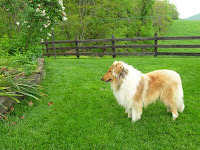 We visited a garden pond dealer who had two pretty collies. One of them had an unfortunate habit of carrying off the water plants that were for sale, though. Meanwhile we are expecting! A dog, that is. It's not a golden one like this. It's a sheltie. Some friends are moving to an apartment in July and cannot take their dog. We agreed to take him in. Maybe he can show Ben some manners. Actually, Ben is doing well except he still eats paper and small indigestible things so I have to watch him carefully unless he's in his crate. At Snickers Gap a major road (now Route 7) crosses the Blue Ridge in Virginia. 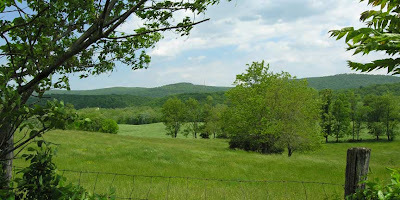 In the picture we're on the old winding road up the hill from Bluemont. 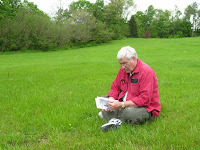 We were there tracing Jubal Early's retreat from Maryland in July 1864. He had managed to cause distress in Washington D.C. by attacking Fort Stevens, but had been forced to retreat. Also his army had failed to reach Point Lookout, where Confederate prisoner's were held. Our class has never been to either Fort Stevens or Point Lookout. They are far from the other sites that we visit chronologically for 1864. 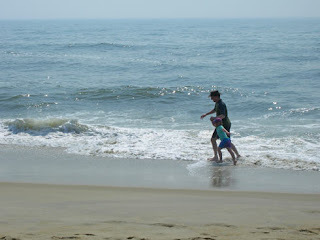 I've been to Point Lookout while on vacation; it's a beautiful peninsula on the Chesapeake. One of these days I should find my photos from that trip. 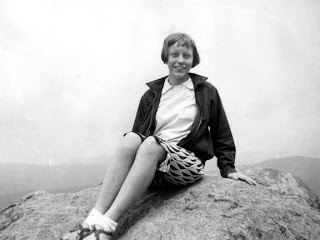 Here's a photograph from 1958. 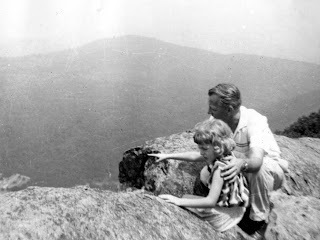 It shows my dad and my younger sister at Mary's Rock, Shenandoah National Park. 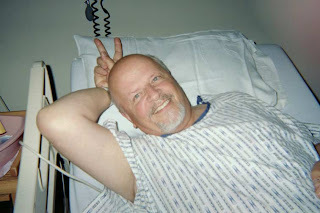 ...Frank was recovering from surgery. I didn't carry my good camera to the hospital, but I usually carry a disposable one in my insulated snack bag, which I put in the car almost every time we go out for more than a few hours. Since then he has shaved off the beard, but now he's letting it grow back. 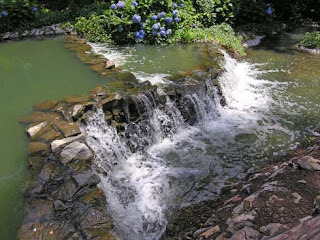 After we toured Monocacy we stopped in Leesburg on the way to Snickers Gap and Cool Spring. 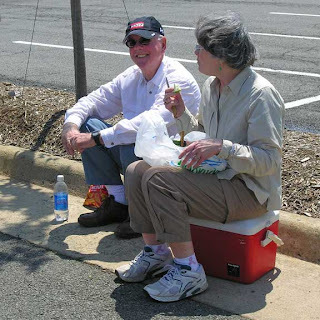 The plan was to picnic at Cool Spring but hunger struck so we ate in a Leesburg parking lot. 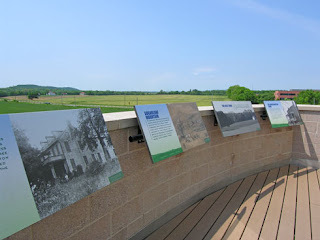 On our trip to Monocacy, we visited the new Visitor Center. Built to look like a large barn, it's modern and pleasant inside. It was not immediately apparent that there was a museum upstairs, but definitely it's worth going up to see it. They've done a lot of interpretation with their artifacts. I've seen small museums full of artifacts with little explanation of what their significance is. This one is the opposite - more information than items, lots of pictures, maps that light up, stories, a full-size model of a farmhouse room with sound effects of the battle. 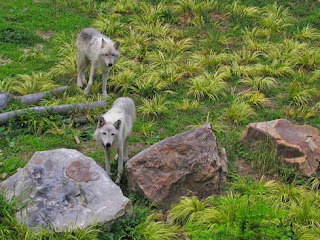 Both adults and children will enjoy these exhibits. See the article on the Monocacy Battlefield Visitor Center in AIArchitect. I hadn't been to the Monocacy Battlefield in about a decade. There's more to see than there was before. It's still a pretty place to visit. 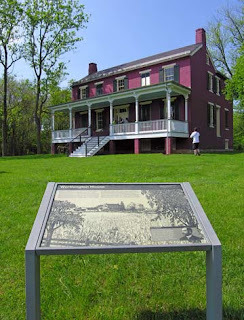 The farm owned by the Best family was also part of the 1862 Maryland Campaign. Lee's "lost order No. 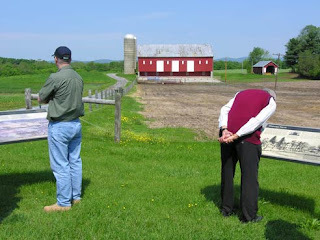 191" was found on this farm by Union soldiers. 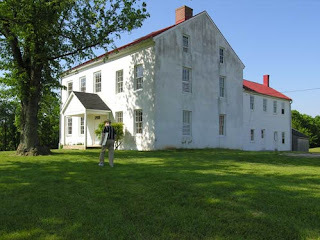 The Worthington Farm (left) has a trail to the Monocacy River where Confederate troops crossed in 1964. They set up artillery in the front yard, and every time the gun fired, the farmyard rooster would crow. 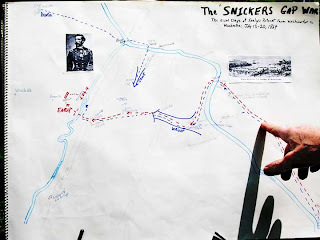 Read the markers "Thick of Battle" and "Thomas Farm". Not shown here is another nearby marker called "Federal Retreat." General Lew Wallace (who later wrote Ben-Hur ) gave the order to retreat. However, his troops had delayed the Confederates long enough that Federal reinforcements could reach Washington DC and protect it against Early's forces.